Dread the Drill? Air Abrasion Can Fix Tooth Cavities without Drilling. Everyone dreads the drill. But if you have a cavity, it’s necessary to rid the tooth of the decayed area and fill it with a substance that will stand up to the demands of your mouth. Enter air abrasion. Let’s face it… everyone dreads the drill. But if you have a cavity, it’s necessary to rid the tooth of the decayed area and fill it with a substance that will stand up to the demands of your mouth. Enter air abrasion. Air abrasion is a way to remove decay from a tooth without using a dental drill. Like a sandblaster removes graffiti from walls, the air abrasion tool blows a powerful air stream of tiny particles made of silica, aluminum oxide or a baking soda mixture on your tooth. These tiny particles bounce off the tooth, blasting away the decay. Air abrasion is most commonly used to prepare teeth for composites or to repair cracks and discolored teeth. Some dental professionals will employ it to prepare teeth for bonding procedures, such as sealants. Air abrasion can also work well to repair fractured, chipped or worn teeth. It is also very useful in preparing teeth for cosmetic surgery such as for the removal of stains and spots, the repair of old fillings, broken crowns and bridges. Air abrasion is quite safe. The only precautions needed before air abrasion are protective eye wear (to prevent eye irritation from the spray) and the use of a rubber dam (a rubber sheet that fits around teeth) or protective resin applied to nearby teeth and gums to protect areas of the mouth that aren’t being treated. Air abrasion generates no heat, pressure, or vibration. 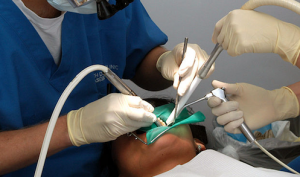 Air abrasion sometimes reduces the need for anesthesia, particularly if the cavity is shallow. Air abrasion leaves more of the healthy tooth tissue behind. Air abrasion reduces the risk of fracturing and chipping of the tooth, which some dentists believe can affect the life span of the filling. The procedure is relatively simple, although it may take longer than traditional drilling. But to make sure air abrasion is right for you, make an appointment with the professionals at Longmeadow Family Dental Care. And see if you can “dump the drill”!